To organize all workers in the entire electrical industry in the United States and Canada, including all those in public and electrical manufacturing, into local unions. 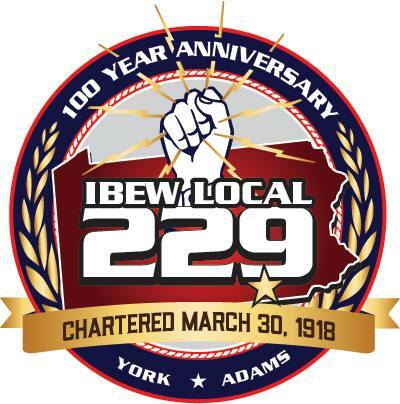 International Brotherhood of Electrical Workers Local Union 229 is York Pennsylvania’s leading labor organization in the electrical construction industry. Each day Local 229 lives up to our International Organizing Statement. Organizing is a goal that every member is empowered to do. We strive to represent the unrepresented workers and raise them to a new living standard while honing their skills to provide the very best electricians for all clients. Local Union 229 will soon celebrate our 100th Anniversary of serving the Greater York Area. Our long standing traditions will help forge the future of our dynamically changing industry. There is absolutely no doubt that the IBEW sets the industry standard for today’s electrician. The IBEW is the industry leader for safe and reliable work. In our contracts lie the guarantee to each and every client that they will receive the absolute best quality and production. Every IBEW Local 229 electrician lives up to the highest industry standards of production and safety. This professionalism allows our members to maintain an excellent standard of living for their families. The word “Brotherhood” lies within our title. There is no stronger bond than our membership. Local 229 members live up to this creed through our numerous internal activities, Retiree’s Club, and community outreach and service programs. Local 229 is a family which develops all new apprentices into the industry workers, teachers, estimators, supervisors and contractors of tomorrow. Local Union 229 and our Affiliated Contractors work together every day to provide the very best service to each client. Our Collective Bargaining Agreement guarantees both members and contractors agreed upon rights in order to provide the world’s finest electricians and a fair standard of living. IBEW Local Union 229 electricians are the industry standard for the Greater York Area. Our superior on the job performance for all clients allows Local Union 229 to be the dominating force in today’s market. It is very simple. We provide the highest skilled, best trained, most productive and safest workers. Combine that with positive, goal-oriented attitudes, and fair and reasonable wages, our electricians are the best investment you can make. Our work hours are negotiated in our Collective Bargaining Agreements. They are agreed upon by our members and contractors in order to meet industry requirements. It is in our International “Code of Excellence” that each and every IBEW member will give a full eight hours of work for eight hours of pay. This simple “Code” coupled with a superior skill set allows our members to enjoy standardized work days and set overtime. Local Union 229's wages and benefits are contractually agreed upon items that each and every member can vote on. Our members enjoy an excellent standard of living with Family Sustaining Wages, Health Insurance, Dental and Vision Coverage, Pensions, and an Annuity. You’ve heard the phrase “you get what you pay for”? Well, our professionals are a perfect example of that. Would you hire the cheapest babysitter for your children? How about the cheapest surgeon for a major operation? No you would not. You’d choose peace of mind, and that is what you get when you choose an Affliated Electrical Contractor that employs IBEW electrical workers. To seek a higher standard of living. Our standard of living is negotiated between our members and contractors. This allows our members to lead a comfortable life while our contractors stay competitive in today’s market. Local 229’s continuing presence in the market allows our members to maintain that higher standard of living while helping our contractors to succeed. Local 229 members enjoy great benefits which have been negotiated in over 98 years of contracts. Security for the individual also translates to the jobsite. Our contractors are the industry leaders with regards to safety training and implementation. Local 229’s commitment to our members and our partners is second to none. We provide the safest and most professional workforce to each client ensuring a successful project. This is a creed that each and every member of Local 229 lives by. Local 229 and its members believe in the philosophy “lead by example”. Everyday our members practice this simple philosophy. This is conveyed through our community service programs, United Way, membership donations, and volunteering of time to many special area projects. IBEW Local 229 gives back each and every day to our community. It is our local community that the future electricians of IBEW Local Union 229 will come from. The mission of IBEW Local Union 229 is the same as it was in 1918; to provide the most skilled and productive workforce in the world while ensuring the safety, rights, and benefits of our membership. It is a statement that we live by every day. Our greatest investment is our membership who will continue to shape the future of our industry. Together, partnering with our contractors, we will continue to define the industry standards providing the very best services for our clients for the next one-hundred years.